Aero Snap is a new window management feature in Windows 7 which lets you snap or fix windows to the edges of your computer screen. The goal of this Aero Snap feature is to provide the user with an effortless way to position your open windows any way you want them, with minimum clicks and effort. What you do is simply drag the windows to any edge of the screen and drop it there. It will stick or align itself to the edge. With Aero Snap you can drag a window and move your mouse to the edge of the screen and the window will re-size to fill half the screen. Repeat with the other window on the other side. With two easy motions you have a setup that makes both of these scenarios much easier to accomplish! These are referred to as Side-by-side windows. With widescreen windows becoming more common, it no longer makes sense for a window to always and only maximize in both dimensions. Having it maximized in the height only to cover half the screen only, also aids reading. “With screens increasing in resolution and widescreen layout becoming more prevalent, the maximized window state can lose some of its appeal in certain cases. E-mail is an example. Reading long lines of text across the screen is not ideal. Your eye simply cannot track a line all the way across. Web browsing is another example. Content will sometimes not fill the entire width of the screen, leaving a lot of unused white space on the side. Now, with Aero Snap you can you can maximize a window in the vertical direction only. When you resize a window to the top of the screen, it will also resize all the way to the bottom.” Detailed read on E7. Windows+Left Arrow – Snap window to left side covering half of desktop space. Continue pressing the keyboard shortcut will rotate the window between snap to left, snap to right and restore to normal position. Windows+Right Arrow – Snap window to right side covering half of desktop space. Continue pressing the keyboard shortcut will rotate the window between snap to left, snap to right and restore to normal position. Windows+Down Arrow – Minimize the window. Restore to normal size and position if the window is currently maximized. If you dont want this feature you can easily Disable Aero Snap. You can add Windows Snap feature to Windows Vista using GridMove. Aero Snap is a cool new window management feature in Windows 7, which lets you snap or fix windows to the edges of your computer screen. This is especially useful if you are working with multiple open windows and you need to compare maybe 2 documents side by side. All you need to do is drag and throw the documents, one each to either side and the windows will snap on either sides, each covering half the screen. However if you do not like or use Aero Snap, you can easily disable it. 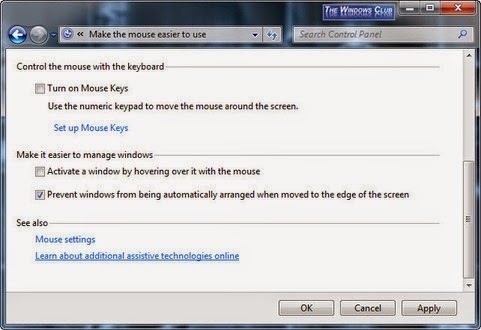 To so so, open Control Panel > Ease of Access center > Make the mouse easier to use > check Prevent windows from being automatically arranged when moved to the edge of the screen > Apply > OK.
Trust you find this tip easy to follow.